It has been a while since the first and second posts of this series, but a lot has happened in the past few months, most notably the fact that the code from eclipselabs is going to be ported to Project Chaupal which will (eventually) be(come) the OSGI implementation of the JXTA specs. As a result, I decided to rename the packages and make the architecture as clean as possible prior to the change. This tutorial will cover some of the features which are already available, and can help to make the development of JXTA applications in Eclipse/Equinox a bit easier. NOTE: This tutorial uses a revisioned version of the Extended libraries, and readers who worked with the previous tutorials may find that their code will no longer compile. The tutorial has been updated to reflect the changes. You can get the new libraries here . A quick recap. The previous tutorials demonstrated ways to get existing JXTA applications working in Equinox. A few examples from the book Practical JXTA II were wrapped into OSGI bundles, and could be started and viewed in the Eclipse IDE. This bundle is not a valid JP2P Bundle. A JP2P-INF directory is required. We can now start to utilise this feature of the Chaupal architecture. There's another small change with respect to the OSGI component of the previous tutorial, and this is that a Jp2pStartupService has replaced the NetworkManager. With this, you should be able to run the bundle in the IDE that you made previously. Relaunch and take a look at the JP2P Container Navigator. As you can see, the container now shows a tree which represents a JP2P bundle. In fact, the above XML describes the 'Jack the Rendezvous' example of Practical JXTA II! This is what 'Anna the Edge Peer' looks like. 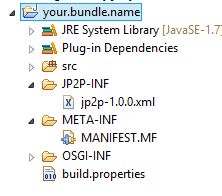 In JP2P these dependencies are hidden behind the JP2P services. The mutual relationships are still there, of course, but in the container they are represented as a fairly clean list of services. Besides this, a service implementer will only have to go through the deep and shady crevices of JXTA once, and share the results with the community, who then only will have to concern themselves with the necessary configuration issues. As a long-term user of JXTA, this is what I really missed in all these years! As a demonstration of this different perspective, take a look at the JP2P Navigator Tree above. The net peergroup has become a separate service under the container root. 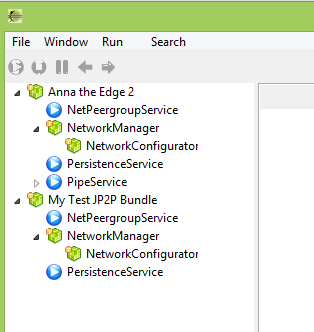 Even though this peergroup is tightly connected to the network manager in JXTA (through the startNetwork() method, this does not show in the JP2P container. This implementation choice is hidden in the configuration. The startup-service takes care of activating the container. The auto-start directive tells the application to start as soon as possible. Concretely, this means that the network manager service will perform a 'startNetwork' once it is configured. The persistence-service is going to take care of all the properties that need to be persisted, particularly the peer- and peergroup ids that you need to create once, after which you want to use them every time you restart the application. The context directive tells the parser to select the persistency provided by OSGI. By default, the application will create a properties file in the home-folder for this functionality. Note that these services are all independent of JXTA. A JP2P service is not in any way related to the JXTA libraries. In fact, the core functionality is provided by the net.jp2p.container package, which only has dependencies with JAVA classes. JXTA functionality is provided by the net.jp2p.jxta bundle, which is a so-called fragment with the libraries needed to include JXTA services in the JP2P container. If this fragment is not included, then the parser will not recognise the network-manager and network-configurator service. If you see something like this, then you have successfully made contact between two peers! If you relaunch your application, the observer will start to spawn messages when JP2P services are added to (or removed from) the container. This tutorial has introduced the JP2P container as a means to make a shift from programming JXTA applications to configuring them. A lot of the implementation details are hidden for the implementer of a JXTA application, who only needs to understand the services and the properties that can be included. Currently a lot of functionality still needs to be implemented, but the container can already be used, as developers can hook into the code at any given point and extend or modify the provided functionality. The next tutorial will demonstrate how you can develop your own services (or libraries).